Two years ago, in the middle of the night, a fire broke out in a commercial building on the northern edge of the city of Dallas. It destroyed a small yogurt company called Three Happy Cows. Two months later, Edgar Diaz, the founder of Three Happy Cows, confessed that he'd set the fire. Yet people who knew Diaz, and had worked with him, could not believe it. "I was like, Edgar did that? No way! No way. No way," says Ruth Cruz, who worked at Three Happy Cows. "No. No. It was his baby. Couldn't imagine," says Don Seale, who supplied milk to the factory. They, and others, say Edgar Diaz loved Three Happy Cows. He'd built that factory himself. So why did he burn it down? The answer is a love story, in a way. It's a love affair with yogurt. Edgar Diaz now occupies a cell in the federal prison in Seagoville, Texas, and that is where I met him. Diaz is a short, soft-spoken man, 57 years old. One of the arson investigators who took his confession described him as "meek." He struggles, on occasion, to express himself in English. He only learned the language as an adult, after emigrating from Colombia. It was in Colombia, at the university, where Diaz first fell in love with yogurt. He studied the science and technology of dairy products. "I love to work with milk," he says. "For me, milk is a life element." But he and his wife fled Colombia's civil war in 2001. They were granted political asylum in the United States. Diaz worked at a Wendy's for a while, and sold used cars. His wife, Diana Ocampo, who had also studied dairy science, cleaned houses. A series of fortunate connections brought Diaz back to his first love. In 2010, a friend offered to put up the money to start a new yogurt company: Three Happy Cows. And Edgar Diaz threw himself into building that factory. "All the plant is designed for me," he says. "Even the walls. The walls [are] glass. Because I love for people to see how we made it. We don't have anything hiding." From 2010 to 2013, Three Happy Cows had some remarkable success. The yogurt won national awards. It was a hit at farmers markets around Dallas. "The product was really exceptionally good," says Cindy Johnson, who founded the farmers market in the town of McKinney. "It was just the first place everybody stopped. I mean, it's hard to describe just how good it was!" Diaz loved making a product that people enjoyed so much. Even now, in prison, his eyes light up and his voice becomes animated when he remembers talking to satisfied customers. "That is my reward!" he says. "It's not money! You enjoy the product. Your life is happy because you eat it and you like it!" After three years, though, Three Happy Cows still was not profitable. The company's financial backer, Diaz's friend Juan Padilla, was running out of money. Diaz found some new investors, but this is where things started to come unglued. He couldn't control what happened next. Diaz says that he and Juan Padilla had a verbal agreement. Padilla would own 75 percent of the company, and Diaz would own 25 percent. But legally, the company wasn't set up that way. Padilla owned it. The new investors, realizing this, began negotiations with Padilla. They acquired an option to buy the company, in the future. Padilla also turned over management of Three Happy Cows to the new investors. That happened right away. "The next week, all my belongings in my office [are] in the trash. They took everything and put it in the trash," says Diaz. Other changes followed. "They change the milk, they don't use anymore organic milk," says Ocampo, Diaz's wife. "The honey? 'Oh, this honey is cheaper — just use it.' Also the fruit, the sugar, everything. They change everything," Ocampo says. Diaz was still working at Three Happy Cows, but only as an employee; he'd lost control of the thing he loved more than almost anything else. I tried, through phone calls and a letter, to get Padilla's side of this story. Padilla responded only with a text message saying that he didn't want to talk about Three Happy Cows. It was, he wrote, "too painful." I was able to speak with Blaine Iler, one of the investors who took control of Three Happy Cows. "I feel like we did everything we could to meet Edgar's concerns," Iler says. He says he and his partners offered Diaz a contract that would have made Diaz part owner of Three Happy Cows when the investors eventually bought the company. But Diaz didn't sign that contract. According to Diaz, it was because it contained a clause that barred him from working for any other yogurt company if he left Three Happy Cows, for a period of five years. Diaz says that would have stripped him of his experience and knowledge. In fact, in Diaz's mind, that knowledge was his only source of power, and he had to protect that knowledge from the new investors. He describes repeated conversations in which the new investors demanded the "formula" for making Three Happy Cows yogurt. "They try to find records" of how to make the yogurt, Diaz says. "The records are over there. But how to make it?" Diaz points toward his head. "How to make it is here." His mind, though, was growing increasingly dark and troubled through this time. "You work so hard, but your feelings go down. You go into depression," he says. "I drive to Three Happy Cows and I cry, and I don't understand how some people can destroy everything. We worked 36 months, and these people destroy everything in three months." In March 2013, the company arrived at a crossroads. It received its biggest order ever. The investors felt that it could lead to even bigger success down the road. Edgar Diaz worked through the weekend to make the yogurt. In the wee hours of Monday morning, March 18, he returned to the factory. "And I go to the cooler and open the tanks, and I see, I did it! I feel so happy, but at the same time, I feel so stupid. Because they know how I made it," he says. Whether this feeling was delusion or reality, Diaz became convinced that the investors now knew how the yogurt was made. It was no longer his secret. "I come into a panic," he recalls. "I want to die. I start to walk to crazy around the plant." He found some gasoline, and set the place on fire. Six months ago, in January, Diaz was sentenced to five years in prison. He and his wife have declared bankruptcy. She's cleaning houses for a living, often from early in the morning until late in the evening. "Do you think you are a good businessman?" I ask Diaz. "No," he replies quickly. "When you're thinking too much with this" — he points to his heart — "you are not good businessman." "Did your heart destroy your business?" Diaz considers. "No. Destroy is, when people thinking it's only money. Business is not only money. Business is adventure. It's to enjoy. Make you happy. Sad, sometimes. But it's life. That's business." And Edgar Diaz is still dreaming of making yogurt. Even here in prison, he says, he could probably make yogurt. They get milk. The bacteria one needs often are there in the milk already. All it takes is the skill. And the love. This week, we'll bring you stories about an ancient food that's being reinvented - yogurt. And our first episode involves a crime. 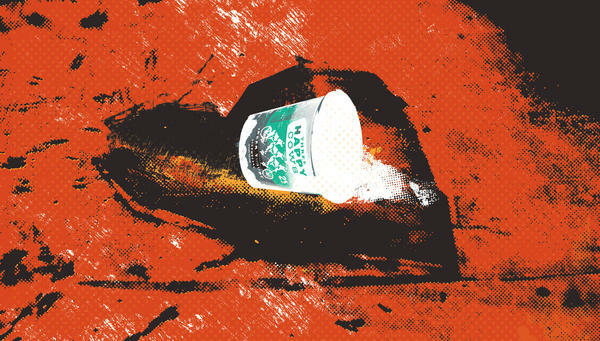 Here's NPR's Dan Charles with the story of one ill-fated love affair with yogurt. DAN CHARLES, BYLINE: Two years ago, in the middle of the night, a fire broke out in a commercial building on the northern edge of the city of Dallas. It destroyed a small yogurt company called Three Happy Cows. Two months later, the founder of Three Happy Cows, a man named Edgar Diaz, confessed that he'd set the fire. The people who knew him could not believe it. RUTH CRUZ: I was like, Edgar did that? Just like - no way. Like, no way. CHARLES: Ruth Cruz worked with Diaz at Three Happy Cows, and Don Seale provided the milk. DON SEALE: No, no, no, it was his baby. No - couldn't imagine. CHARLES: Why did Edgar Diaz burn down something that he loved? I drove to the federal penitentiary in Seagoville, Texas, to find out. EDGAR DIAZ: My name is Edgar Diaz. I'm 57 years old. I came from Colombia, in Bogota. CHARLES: You were in Bogota? CHARLES: Edgar Diaz fell in love with yogurt back at the university in Colombia, studying dairy science. DIAZ: I loved to work with milk. For me, the milk is a life element. CHARLES: But he fled from Colombia's civil war, came to the U.S. And in 2010, one of his friends put up the money to start a yogurt company here - Three Happy Cows. And Edgar Diaz threw himself into building that factory. DIAZ: All the plant is designed for me. CHARLES: Just the way you like it. DIAZ: Yes. And even the walls, the walls is glass because I love the people see how we made it. We don't have nothing hiding. And we start making the yogurt. CHARLES: Three Happy Cows yogurt won national awards. It was a hit at farmers markets around Dallas, like the one that Cindy Johnson set up in the town of McKinney. CINDY JOHNSON: The product was exceptionally good. It was just the first place everybody stopped. I mean, it's hard to describe how good it was. CHARLES: And Edgar Diaz just loved making a product the people enjoyed so much. DIAZ: That is my reward. It's not money. You enjoy the product. Your life is happy because you eat it and you like it. CHARLES: But after three years, Three Happy Cows still was not profitable. And the company's financial backer, Diaz's friend Juan Padilla, was running out of money. Edgar Diaz found some new investors, but here's where things started to come unglued because Diaz could not control what happened next. Diaz says Juan Padilla had promised to make him part owner, but legally the company wasn't set up that way. Juan Padilla owned it. And Juan Padilla turned over management of Three Happy Cows to the new investors. DIAZ: And the next week, I have my office. All my belongings of the office is in the trash. They took everything and put it in the trash. CHARLES: Other changes followed. Here's Diana Ocampo, Diaz's wife. DIANA OCAMPO: They don't use anymore organic milk. The honey - oh, this honey's more cheaper. Just use it. And the fruit, the sugar, everything - they change everything. CHARLES: Edgar Diaz was still working there, but only as an employee. He'd lost control of the thing he'd loved almost more than anything. I tried to contact Juan Padilla to get his side of the story, but Padilla responded by text message saying he didn't want to talk about it. The investors who took control of Three Happy Cows weren't willing to be interviewed on tape, but I did talk with one of them. The investor told me he and his partners had tried to meet Diaz's concerns. They'd offered Edgar Diaz a contract that would've made him part owner of Three Happy Cows when the investors eventually bought the company. But Diaz didn't sign that contract, he says because it contained a clause that said if he left Three Happy Cows, he couldn't make yogurt for anyone else for five years. Diaz says that amounted to stripping him of his experience and his knowledge. In fact, in Edgar Diaz's mind, that knowledge was his only source of power, and he had to protect that knowledge from the new investors. He says they wanted the formula for making Three Happy Cows yogurt. DIAZ: What is the formula? They don't realize the difference is the process. CHARLES: So you know the process? CHARLES: You know how to make it? CHARLES: They don't know how to make it? CHARLES: Diaz points toward his head. CHARLES: Edgar Diaz's mind was growing increasingly dark and troubled through this time. DIAZ: You work so hard, but your feelings go down and you go to depression. And sometime, I go and drive in to Three Happy Cows and I cry, and I didn't understand. I say, how some people can destroy everything? We working 36 months, and these people destroy everything in three months. CHARLES: In March 2013, the company arrives at a crossroads. It has received its biggest order ever, maybe a sign of more success to come. Edgar Diaz works through a weekend to make the yogurt. In the wee hours of Monday morning, March 18, he returns to the factory. DIAZ: When I go to the cooler and I open the tanks and I saw I did it, I feel so happy. But at the same time, I feel so stupid because they know how I made it. CHARLES: Whether this is delusion or reality, Diaz somehow is convinced that the investors now know how the yogurt is made. It's no longer his secret. DIAZ: I come in and panic. I feel - I want to die. I want to suicide, you know? And I start walking like crazy around the plant. CHARLES: He finds some gasoline and sets the place on fire. This past January, Edgar Diaz was sentenced to five years in prison. He and his wife, Diana, declared bankruptcy. She's working night and day cleaning houses. Sitting in the prison's visiting room, Diaz tells me, I'm not a good businessman. I think with my heart. Did your heart destroy your business? DIAZ: No. Destroy is the people they only thinking is money. Business is not only money. Business is adventure. You enjoy it. It's something make you happy. Sad, sometimes? Yes. But it's the life. That's the business. CHARLES: And Edgar Diaz is still dreaming of making yogurt. Even here in prison, he says, I could probably make yogurt. We get milk. The bacteria you need often are there in the milk already. All it takes is the skill and the love. Dan Charles, NPR News. Transcript provided by NPR, Copyright NPR.